Description: Berkeley was an admirer of the French school which included Fauré, Ravel and Poulenc and his 1942 work, modest yet elegant, is cut from that cloth wheras Françaix (1934) has the brash sparkiness we naturally associate with him. Alwyn’s sonatina comes from 1935 and is in his early, post-Romantic style. Crosse wrote his piece for the violinist here in 2010 and it has a dramatic and contrapuntal first movement, a short lament in Scottish style and a skittish and playful finale. A reworking of a cello-and-piano piece titled Songs and Dances, Frances-Hoad’s contribution has a somber first movement (marked “Quietly Dignified”) and a highly-spirited second one before returning to the general mood of the first movement and a peaceful conclusion. 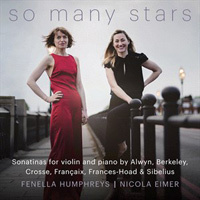 Fenella Humphreys (violin), Nicola Eimer (piano).